Perhaps no other diagnosis affects body, mind, and spirit as powerfully as cancer. 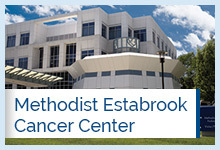 At Methodist, you can feel confident that you are receiving the best care and the best chance to overcome that diagnosis.The cancer care experts at Methodist Health System are dedicated to providing the most advanced care and treatments in a compassionate, healing and nurturing environment. You will receive care from highly-trained oncologists and care providers who specialize in the treatment of cancer. Our clinics use state-of-the-art technology in the fields of lung and thoracic cancers, head and neck cancers, breast cancer and gynecologic cancer. Our cancer centers participate in nationwide clinical trials, giving you the opportunity to participate in some of the newest and most progressive treatments available. 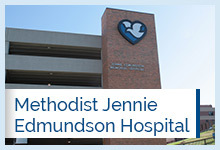 Cancer care at Methodist Health System is offered through a multidisciplinary team approach. This means that specialists in oncology and other medical specialties collaborate to develop a unique, comprehensive treatment plan for each cancer patient to ensure the highest level of care. Our multidisciplinary team also includes the services of cancer nutritionists, cancer behavioral health specialists, physical, occupational and speech therapists and social workers. These health care professionals collaborate to provide a holistic approach to your care that encompasses the mind, body, and spirit of each patient.